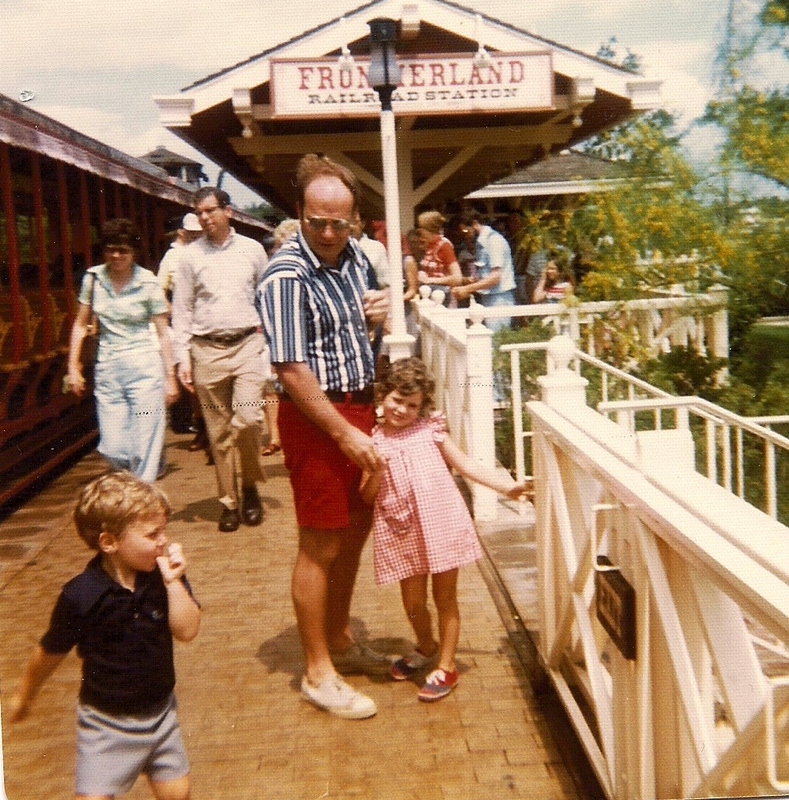 Who said kids have all the fun in Central Florida? The Hilton Orlando Bonnet Creek reminded me adults, whether traveling solo, as a couple or with a group, can have just as much of a good time as children. 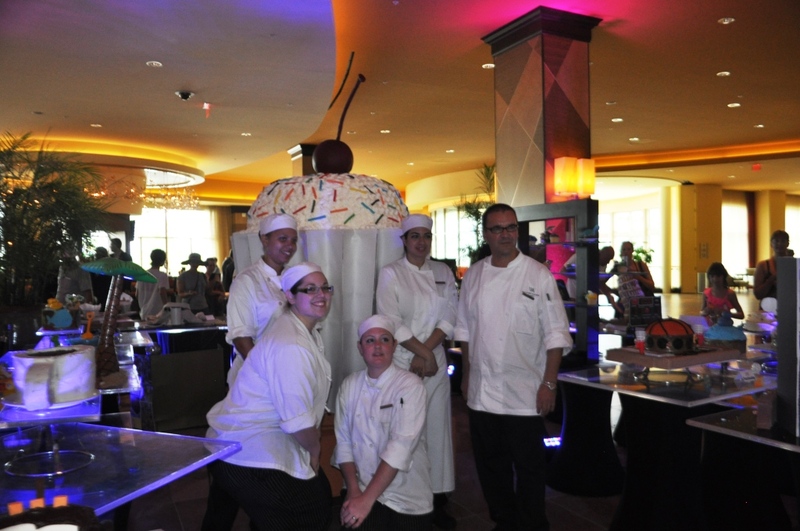 I recently landed smack dab in the middle of Cupcake Lovers Weekend, part of the hotel’s SummerBlast! Weekend series. Sure, the sugared-up extravaganza included adorable cupcakes evoking “ooohs” and “ahhhs” but it also included delicious moments only a mature palate would appreciate. Stepping foot into the Hilton lobby I immediately spied two sculptures of over-sized cupcakes flanking either side of the entrance. 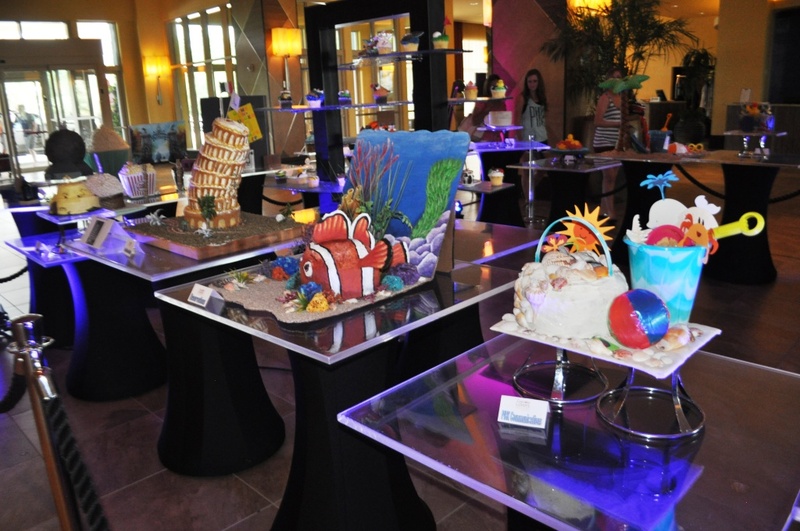 Directly ahead was a display of artistically designed cupcakes created by Hilton’s Team Members ranging from designs representing popular attractions to various hotel departments. My favorite was an over-sized cupcake crafted to look like a sheep. 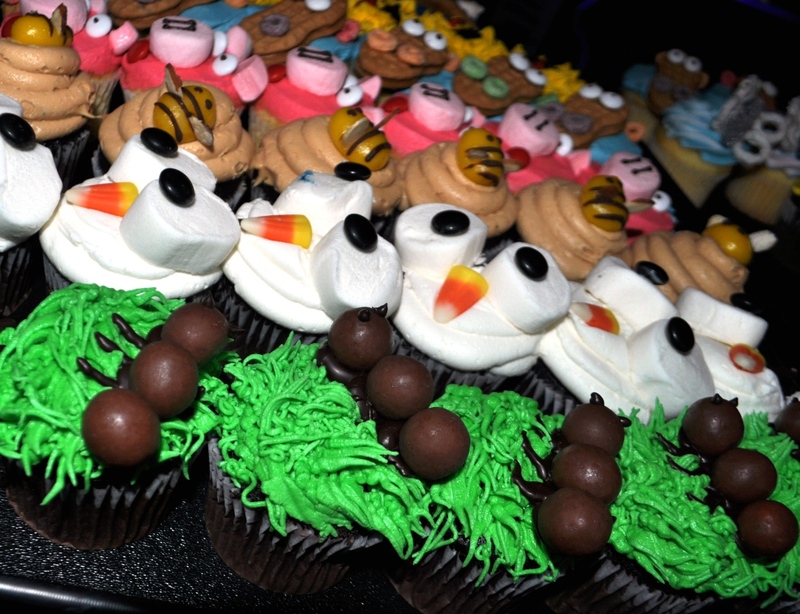 This was the Hilton Orlando Bonnet Creek’s Third Cupcake Lovers Weekend and I was invited to see what all the delicious fun was about. I must say, the hotel impressed me with their creativity in carrying the cupcake theme throughout the property. 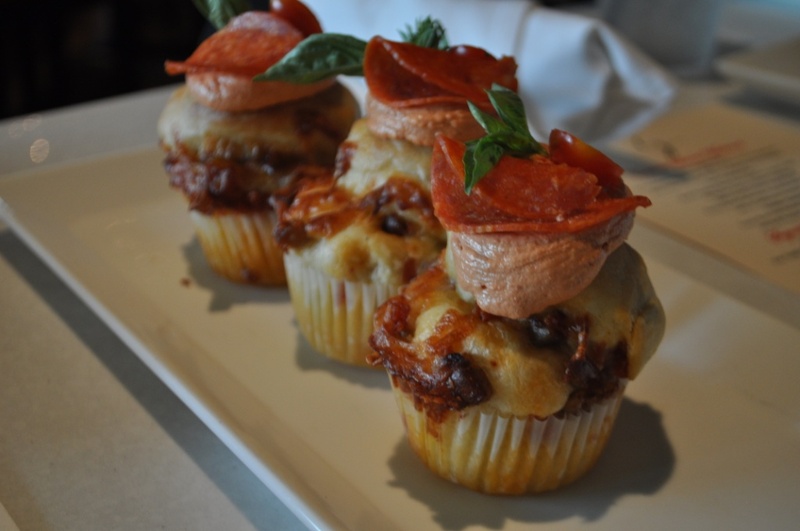 In recognition of the weekend’s theme, the bistro served up a flight of savory cupcakes in flavors of Pizza, Taco, Spicy Conch Fritter and Crab. With the exception of Pizza and maybe Taco, what kid would eat these? 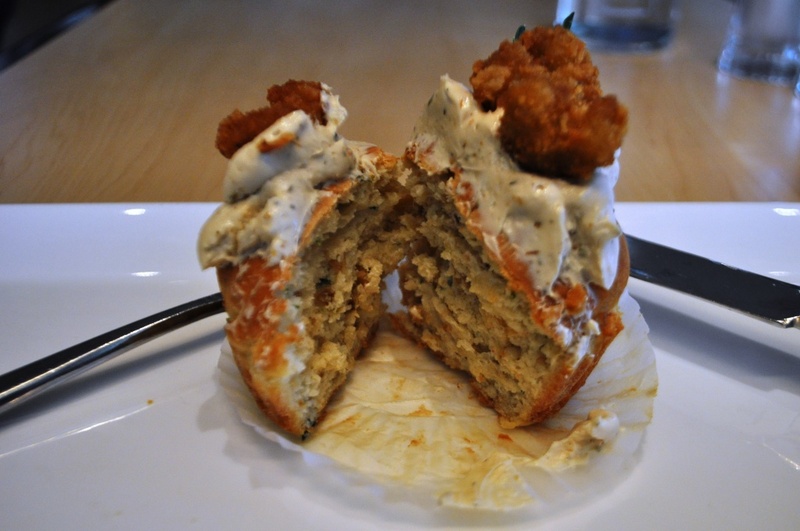 This kid of heart tried the Spicy Conch Fritter Cupcake and it was delish! I’m not quite sure but I believe the main cupcake was flavored with rosemary or thyme and topped with a spicy remoulade and deep-fried conch. Not only is that an adult food, it’s a Florida adult food! 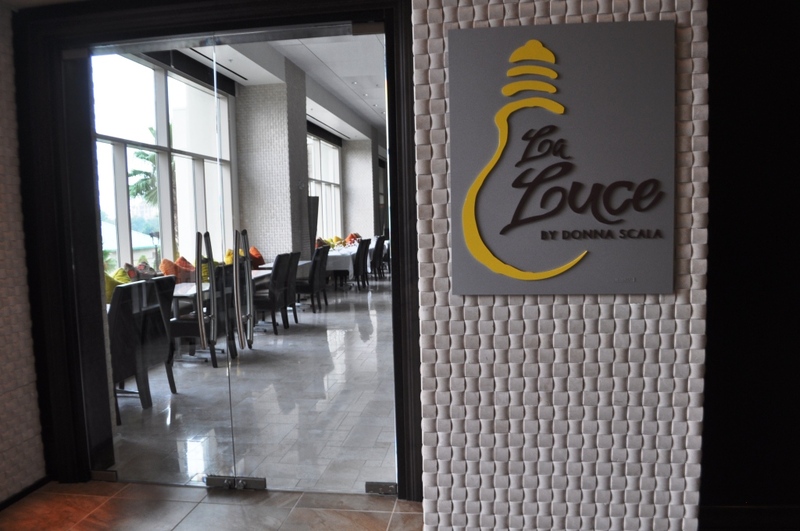 In addition to Harvest Bistro, another guest told me to try La Luce for dinner next time I visit. 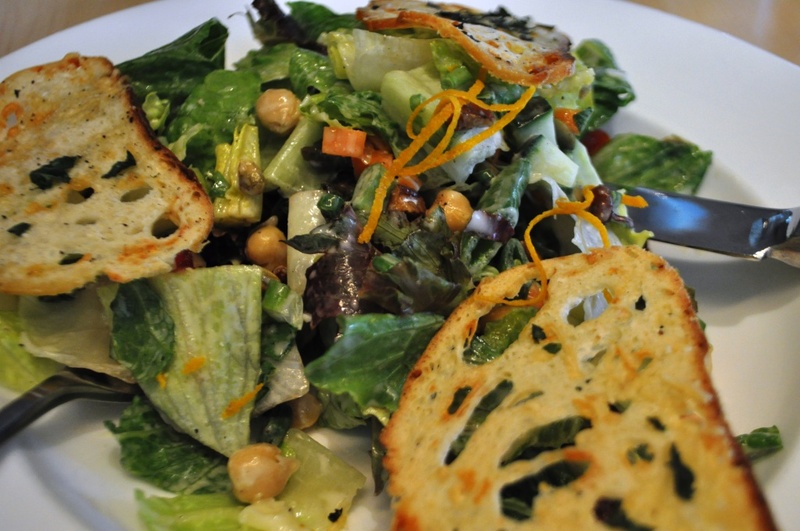 It’s the resort’s signature restaurant by Napa Valley chef Donna Scala. The interior looked chic and a little more formal while the menu looked sophisticated and scrumptious. There are about 10 other eateries and bars onsite. Later that afternoon was the Big Cupcake Reveal. 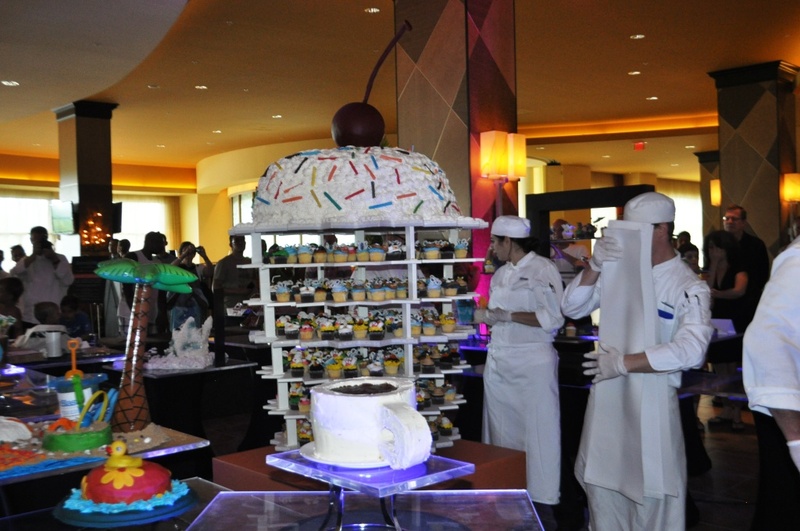 When I say BIG, I mean a 7-foot-tall cupcake was rolled into the Hilton lobby and pastry chefs who baked and decorated 2,000 cupcakes in the week leading up to the weekend, stood by for the reveal. Guests crowded around the giant cake and after a series of birthday wishes to staff and guests celebrating another year, the over-sized paper cup was peeled away and 1,000 individually cupcakes were quickly pulled out and distributed to hungry visitors. Perusing the designs and deciding which to taste was like drooling over a Pinterest party idea board. 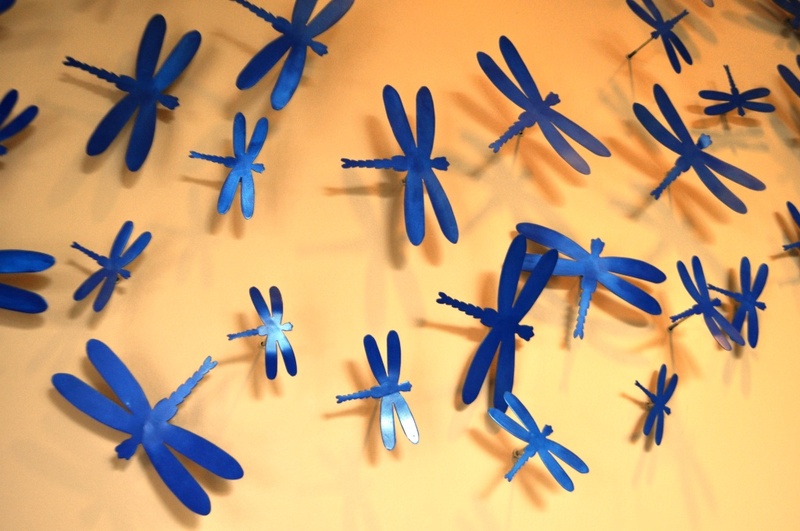 There were alligators, Cookie Monsters, butterflies and whimsical critters. It’s obvious this is a favorite event of hotel guests. 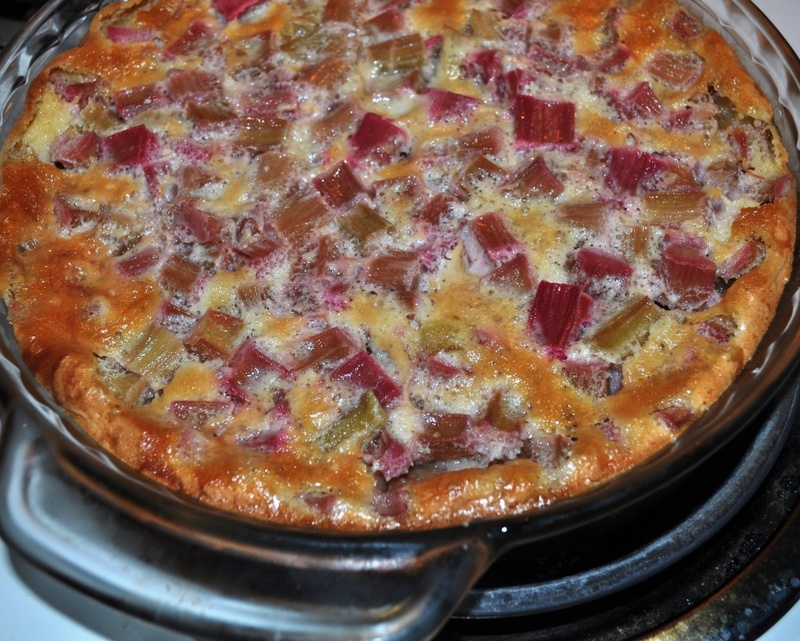 The kids weren’t the ones elbowing their way to these sugary delights, it was the adults! Perhaps the highlight of Cupcake Lovers Weekend was learning the secrets of oh-so-delicious cupcake martinis served in the Hilton’s bars. I had a special a one-on-one session with Daniel Iachello, general manager of Beech, the pool bar and grille, as well as genius mixologist and sommelier for the hotel. In fact, this was such a special moment, it deserves its own post, so stay tuned! 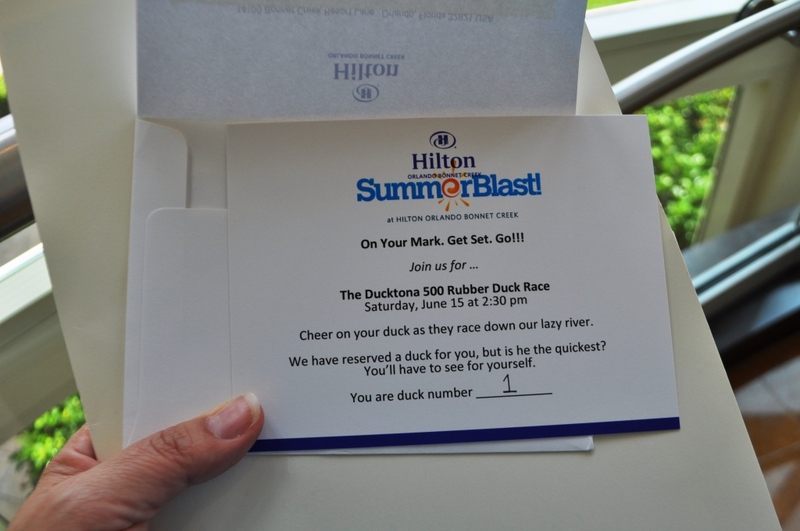 The Ducktona 500 is one of several fun activities during the SummerBlast! Season. 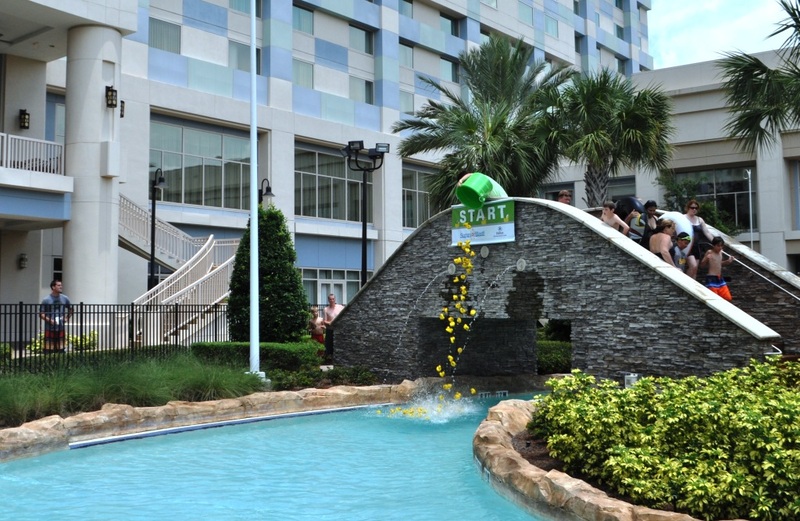 Held each Saturday, guests are invited to “adopt” a yellow rubber duck in a race through a portion of the hotel’s lazy river. 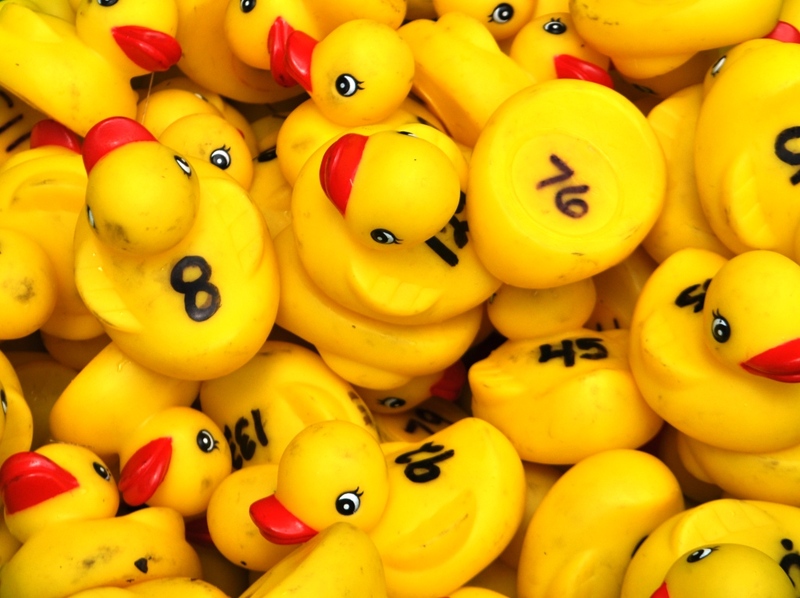 I had my duck and happily got caught in the excitement of cheering it on as it quickly wobbled with the pack of other yellow ducks to the finish line. I wasn’t a winner but was rewarded in so many other ways that day. Hilton Orlando Bonnet Creek is surrounded by Walt Disney World Resort so if you’d like to play with the mouse, it’s easy to hop on a nearby free shuttle to visit the park of your choice. A 482-acre nature preserve surrounds the resort making it a quiet retreat from the thrill of Central Florida’s theme parks. 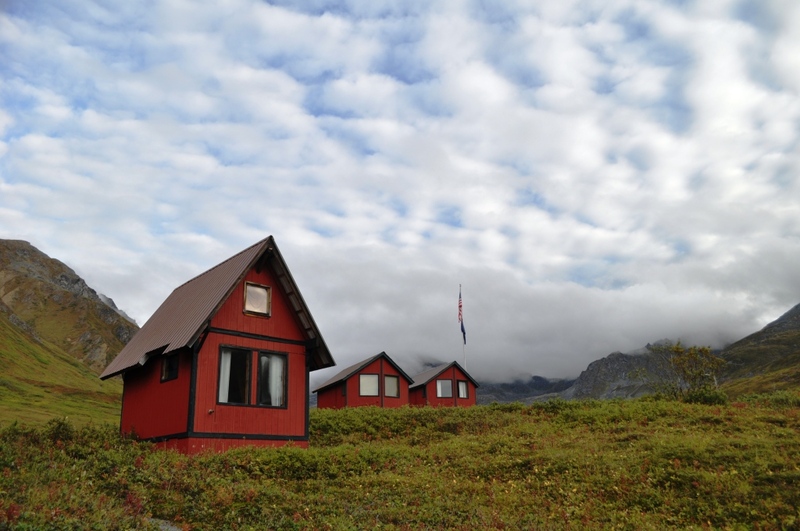 I’m a Hilton Honors member so this hotel also appeal to me because I can earn points for future free stays or upgrades. Looking for a place to be treated like royalty? This is the place. Everyone I came in contact with was extremely nice and welcoming. They made me feel as though I belong. Go Have a Blast during SummerBlast! Now in its third season, SummerBlast! is the Hilton Orlando Bonnet Creek’s summer-long schedule of activities and special programming. Between May 24 and Sept. 1, 2013, guests can engage in daily activities as special pool activities, Dive-In Movie Nights, S’mores by the fire pit and Twilight Golf at the nearby Waldorf Astoria Golf Club. Saturdays and Sundays, guests can take advantage of the Golf Getaway Package at Waldorf Astoria Golf Club for $95 including rental clubs and a $20 food and beverage credit at the cart. Need tips to improve your game? Enjoy small group golf instructions during the Saturday Golf Clinics for $35 per person with includes a sleeve of logo golf balls. Contact the Golf Club at 407-597-3780 for both the Golf Getaway Package and Golf Clinic. 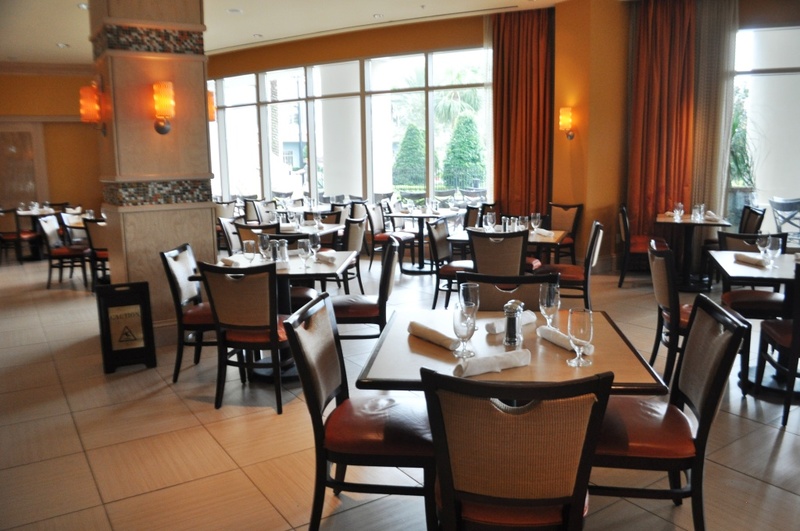 Plan the great escape to Orlando with the Hilton Orlando Bonnet Creek’s Great Escape package. 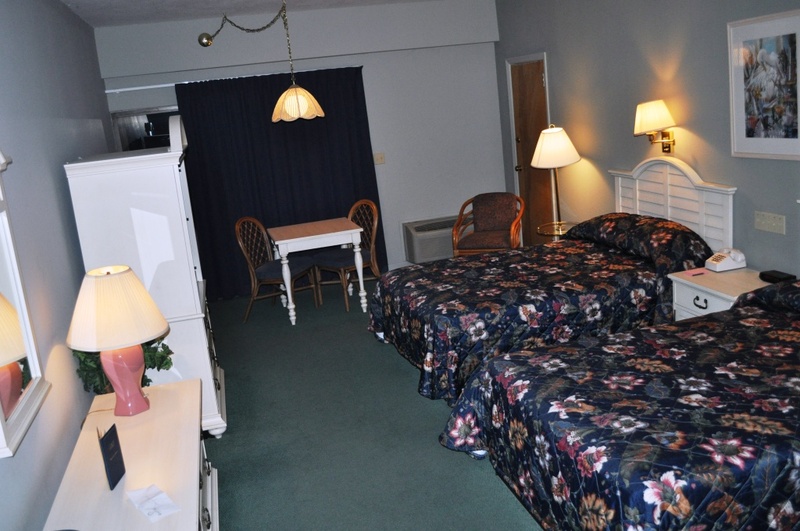 Rates start at $152 per night, based on a two-night stay, plus taxes. Visit www.hiltonbonnetcreek.com/summerblast or call 1-888-353-2013.